Unsurprisingly, one of the more popular features of my Gallery Talks is the drawing that is held at the end where one of my paintings is given away to one of the the folks in attendance. Who doesn’t want to win something? But it’s also one of my favorite parts of the talks. It’s an opportunity to express my gratitude in a small but tangible way for this path as an artist that many of the people at these talks have allowed me to pursue. I never felt any sort of entitlement to walk this path, that I ever possessed any sort of extraordinary talent, training or knowledge that dictated that I follow this path. I knew that my only attribute was a desire to be heard, to stand as an individual voice. I knew that I was going to have to work hard and have a lot of good luck and help along the way if I were ever to move along it. I believe that I have worked hard and I know that I have had more than my share of good fortune and help along the way, much of it given by those who have come to my shows and talks over the years. With their support and the encouragement that they and so many others like them have given, I continue down the path that I have enjoyed travelling for so long now. So showing a little gratitude is not something I take lightly. It is a responsibility, a mandate. As I have pointed out, I try to choose paintings to give away at the talks that have meaning for me, that give me a little twinge of regret in letting them go. And I think the piece I have chose for Saturday’s talk fills that bill very well. It is titled Through Time and has been a personal favorite for a while now. 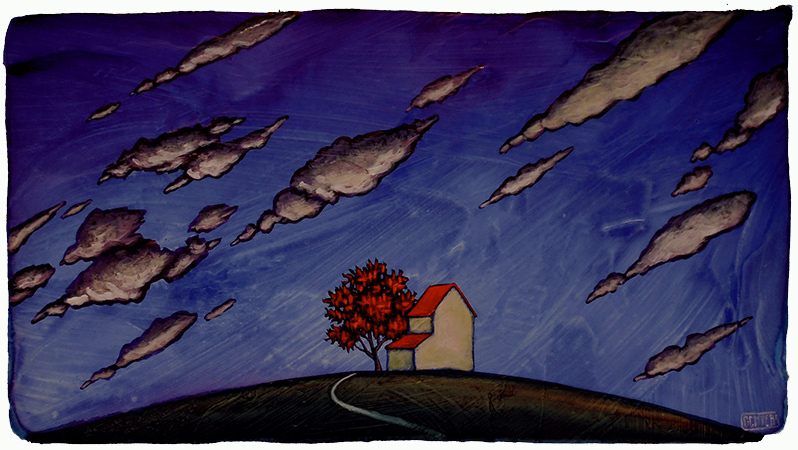 It’s a simple composition with some of my recognizable elements– the Red Tree , the Red Roofs and the winding path- set against clouds that travel diagonally across the sky. I think the thing about this piece that attaches it so strongly to me is that I see it as representing art’s ability to travel through time, to be always in the present regardless of when it is experienced. I know that my days on this planet are limited but my hope is that my work will somehow outlive me and connect the emotions and sensations I have felt in this life to someone in the future who sees those same things in their own life when they look upon the work. While I will be gone and unaware of it, this lets me see my work as a time traveler of sorts. And that’s what I see in this painting and why I hold it in my own high esteem. I want someone else to have it so that it might start it’s own journey. Maybe you could help it on its way. The Gallery Talk takes place at the West End Gallery on beautiful Market Street in Corning this coming Saturday, August 5. It starts at 1 PM and runs about an hour with the drawing for Through Time taking place at the end. Along with the drawing, there will be refreshments, some stories and what is usually a very good conversation. 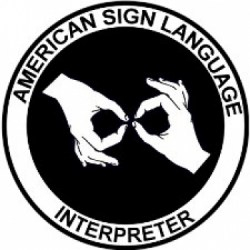 Plus, this year we have the services of an American Sign Language interpreter for our deaf friends. Please RSVP the gallery at 607-936-2011 for seating near the interpreter. So, try to come out Saturday to the West End Gallery. I will do my best to make it worth your while.